Thekchen Chöling, Dharamsala, HP, India. 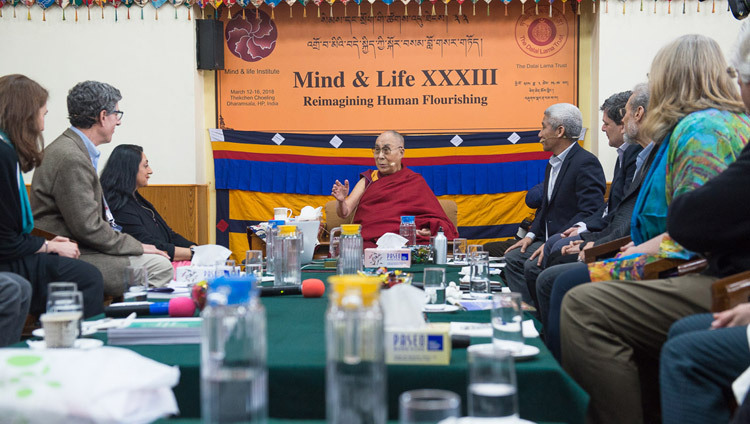 March 14, 2018 – As His Holiness the Dalai Lama sat down at the start of the third day of the Mind & Life Conference this morning, Richard Davidson, today’s moderator, asked him how long he had slept. “Nine hours,” he replied and went on to tell the story of a political leader he got to know in Arunachal Pradesh who asked the same question. His Holiness told him he’d slept nine hours and that he got up at 3am to engage in meditation to sharpen his mind so he could better cheat people. The politician laughed and retorted that since he only slept six hours he obviously wasn’t equipped to cheat people. Davidson said that after hearing about the basic science behind SEEL on the first day and seeing examples of it in action yesterday, today and tomorrow would be spent looking at key components of these programs. He introduced Amishi Jha and Sona Dimidjian who would talk about meta-awareness and attention training in their work, adding that Thupten Jinpa would finish up the session, appraising these topics from a Buddhist perspective. Amishi Jha researches attention and meta-awareness. A common example is of someone having the intention to read a book. They begin reading, but a point comes when they realize their mind has wandered and they have not in fact been paying attention. That realization is an example of meta-awareness, an explicit awareness of the current content of their consciousness. Attention allows for the selection of a chosen object and the preferential processing of that object. It is a like shining a torch in a dark room. It can be moved from one thing to another and can be focussed within as well as outside. Jha presented experiments to measure attention and meta-awareness involving superimposed images of a face and a house in which the participant is asked to pay attention to one or the other and answer questions about it. Another involved a boring series of faces flashed up with the occasional appearance of an upside down face. If the participant is paying attention, he or she can press a button to indicate seeing the upside down face, otherwise it shows their mind has wandered. His Holiness remarked that there is a categorical difference between mental thought and perception. Animals may have sharper sensory perception, but human beings are better at thinking. Amishi Jha remarked that the ability to pay attention is an important element in mind training. However, on an ordinary level our ability to recognise when our mind has wandered is very poor. Sona Dimidjian talked about her work with mental training in a clinical context. She works particularly with trying to prevent and relieve depression among pregnant women and mothers soon after delivery. It is accepted that attention is paid to mothers’ physical health, but their mental health is also important. She has observed that those involved with Mindfulness Based Cognitive Therapy (MCBT) remain in better shape than those in usual care. His Holiness observed that when someone is depressed even exposure to beautiful scenery fails to arouse their interest. On the other hand, someone who has peace of mind and inner calm as a result of their practice of compassion and understanding of emptiness tends not be so easily dispirited. Dimidjian pointed out that people who have been depressed are eager to prevent its return and enthusiastic to engage in mindfulness training, which can involve paying attention to bodily activity, then mental activity, then difficult thoughts. In this connection meta-awareness involves cultivating awareness of thoughts and feelings without identifying with them, without distraction, but with kindness. Meta-awareness allows for self-respect, for treating yourself kindly, for understanding that you are not your thoughts and for seeing things from a wider perspective. His Holiness again compared physical and mental well-being. If your physical health is basically sound you can resist viral infection. Similarly if your mental health is sound, negative thoughts or experiences will not lower your morale. Since many people trust scientists, they have a responsibility to help the public understand the need for mental as well as physical health. I join my hands, beseeching you. The avowed aim is to protect ethical precepts by guarding the mind through applying mindfulness and meta-awareness. The maintenance of watchful introspection. Returning when forgotten or dispersed. If you guard the door of the mind, you can regulate your behaviour. To succeed two elements are required monitoring awareness and self-awareness. One is a condition of mindfulness and the other is its result. Jinpa suggested that there is a clear opportunity for fruitful cooperation between the contemplative traditions and science in the cultivation of mindfulness and meta-awareness. In a subsequent free ranging discussion, during which His Holiness noted that mindfulness is necessary not only when you are cultivating single-pointedness, but in maintaining analytical meditation too, Amishi Jha asked, “Why does the mind wander in the first place?” He thought for a moment and replied, “One explanation is—that’s the way it is,” which provoked appreciative laughter. After reflection he added that it could also, for example, be a result of intelligence and a roaming curiosity. The session concluded. His Holiness went home and will return again tomorrow.